Background Estrogen receptor (ER)-positive and progesterone receptor (PR)-positive breast tumors are characterized by a gene expression profile exhibiting profound differences from that of ER and PR-negative tumors. GATA-3 gene expression is correlated with ER in breast cancer. Aim We aimed to evaluate immunohistochemically the expression of GATA-3 in invasive breast carcinoma, comparing this with ER and PR status and available clinicopathological features, and also to detect the association between GATA-3 and the included breast cancer molecular subtypes. Materials and methods Fifty invasive breast carcinomas were studied for immunohistochemical demonstration of GATA-3 in the tumor cells. Cases were classified into two equal groups: group 1, that is, ER and PR positive, and group 2, that is, ER and PR negative. Molecular subtyping was applied. Results GATA-3 expression was detected in 88% of cases of group 1 and 56% of cases of group 2, showing direct association with ER and PR (P=0.031) and also significant association with luminal-like breast tumors. In addition, GATA-3 showed an inverse association with Ki-67 (P=0.0269); however, GATA-3 failed to show significant association with any of the clinicopathological parameters. Conclusion GATA-3 is an important luminal marker showing strong association with ER and PR in breast cancers, suggesting being a promising new breast-specific immunomarker that could be used for detection of breast cancer origin in metastatic tumors. Worldwide, more than a million women are diagnosed every year with breast cancer; however, despite this increase, the mortality rate is declining. This is because of a combination of factors including early diagnosis and effective treatment . Grasia et al. documented relations between transcription of the progesterone receptor (PR) gene and estrogen in breast and reproductive tissues, and they found estrogen receptor (ER)-positive breast tumors that lacked PR expression were less responsive to endocrine therapy than those that express PR. Moreover, they detected ER and PR status as not always being stable phenotypes, and they can change over the natural history of the disease or following endocrine treatment. GATA-3 is one of the genes whose expression is correlated with ER expression . GATA-3 is emerging as a sensitive and relatively specific marker for breast carcinomas. Its expression was noted in breast and urothelial carcinomas . It belongs to GATA family that includes six transcription factors, GATA-1 to GATA-6, each of which binds to the DNA consensus sequence (A/T) GATA (A/G) . GATA-3 played a crucial role at multiple stages of breast development, including formation of terminal end buds at puberty and luminal cell differentiation . The frequent absence of expression of currently available breast-specific immunomarkers (such as ER) in metastatic breast carcinomas leads to a need for more studies to discover newer markers. GATA-binding protein 3 (GATA-3) is one the most promising immunomarkers . Accordingly, we aimed in this study to evaluate immunohistochemically expression of GATA-3 in invasive breast carcinoma, comparing this with ER and PR status and available clinicopathological features, and also to detect the association between GATA-3 and the included breast cancer molecular subtypes. This analytical observational cross-sectional study included a series of 50 cases of invasive breast carcinomas obtained through modified radical mastectomy or quadrentectomy with axillary clearance. They were retrieved from the files of the Department of Pathology, Cairo University, between March 2015 and October 2016 guided by their ER and PR status, blinded to clinicopathological data. Patients’ ages ranged from 20 to 76 years. Sample size was calculated using EpiCalc 2000 program, Microsoft Windows, with proportion 88%, null hypothesis value 65%, significance 0.01, and power 80%. The patients’ medical records were revised. Clinicopathological characteristics of our patients are summarized in [Table 1]. Cases with missing data or invasive carcinomas removed by simple mastectomy without axillary clearance were excluded. Depending on the ER and PR status of each case, two groups have been established with 25 cases each. Group 1: ER and PR positive. Group 2: ER and PR negative. Formalin-fixed and paraffin-embedded tissue blocks were cut at 5-μm thickness and then stained by haematoxylin and eosin stain for histopathological examination. The tumors were histologically typed according to the latest available WHO recommendations . Histological grading of invasive ductal, mixed duct, and lobular carcinomas was performed according to the Nottingham combined Grading System , whereas grading of micropapillary carcinoma depended only on the nuclear features and mitotic count of the same grading system . Invasive lobular carcinoma is considered as grade 2 according to latest available WHO publication . Tumor staging was performed using the TNM staging system, and the cases were further divided into prognostic stages . Moreover, lymphovascular invasion was checked, and it was identified as presence of tumor cells within an endothelial-lined space (lymphatic and/or blood vessel) outside the confines of the tumor . Sections of 3–5 µm thickness were prepared from the paraffin blocks, mounted on charged glass slides, and left for overnight incubation at 37°C for proper adherence. For antigen retrieval, Ventana Ultra CC1 was used as buffer at 95–100°C for 32 min. Diaminobenzidine (DAB) was used as chromogen and hematoxylin with bluing reagent as counterstain. Anti-GATA-3 (mouse monoclonal antibody, L50-823) (Cell Marque; Sigma-Aldrich, St Louis, Missouri, USA) was used for immunohistochemical staining in BenchMark XT IHC/ISH staining module (Ventana; Medical Systems, Roche Group, California, USA). Sections of normal breast tissue were used as positive control . GATA-3 is expressed in the nucleus of tumor cells; its evaluation is based on a semiquantitative scoring system. Percentage of positively stained tumor cells was classified as follows: 0=no nuclear expression, 1=1–10% positive tumor nuclei, 2=11–20%, and so on until a maximum score of 10=91–100% positive tumor nuclei. The intensity was scored as follows: 1+ (weak staining), 2+ (moderate staining), and 3+ (strong staining) . Numeric score was obtained by multiplication of percentage and intensity of nuclear expression. Scores starting from 0 to 3 were typed as negative, and scores of at least 4 to a maximum of 30 were considered being positive . Commercially available ER (1 : 50; Dako Corporation, Carpinteria, CA, USA), PR (1 : 10; Dako), HER2/neu (1 : 10; Dako), and Ki-67 (1 : 300, cat. #RB-9043-P; Lab Vision, Thermo Fisher Scientific, Fremont, California, USA) were used as primary antibodies, and steps of immunostaining were performed in BenchMark XT IHC/ISH staining module (Ventana). For ER and PR, nuclear staining in 1% of the cells was considered positive. Her2 grading was as follows: 0, no staining or membrane staining in less than 10% of tumor cells; 1+, faint incomplete membranous staining in more than 10% of tumor cells; 2+, weak/moderate complete membranous staining in greater than 10% of tumor cells; and 3+, strong complete membranous staining in more than 10% of tumor cells. Ki-67 proliferation index was scored as low if less than 14% and as high if equal to or more than 14%. Regarding the molecular subtyping, tumors were classified as luminal A [ER and/or PR positive, HER2–and low Ki-67 (<14%)], luminal B-HER2 negative [ER and/or PR positive, HER2–and high Ki-67 (>14%)], luminal B-HER2 positive (ER and/or PR positive, HER2 positive and any Ki-67), and triple negative ‘ER and PGR absent and HER2 negative’ . Statistical package for the social sciences (statistical product for services solutions, version 22.0; IBM Corporation, New York, New York, USA) was used. Categorical data were analyzed using χ2-test. Comparison of numerical variables was done using unpaired Student’s t-test for independent samples in comparing two groups. Comparing more than two groups was done using Kruskal–Wallis test (KW). The P value of less than 0.05 was chosen to represent statistical significance. Fifty female cases of breast carcinomas were studied. Age of the patients ranged from 20 to 76 years, with a mean age of 55.9±11.76 years, and 52% of patients were older than 56 years. Nuclear expression of GATA-3 was detected in 36 (72%) cases ([Figure 1]), whereas 14 (28%) cases were negative ([Figure 2]). 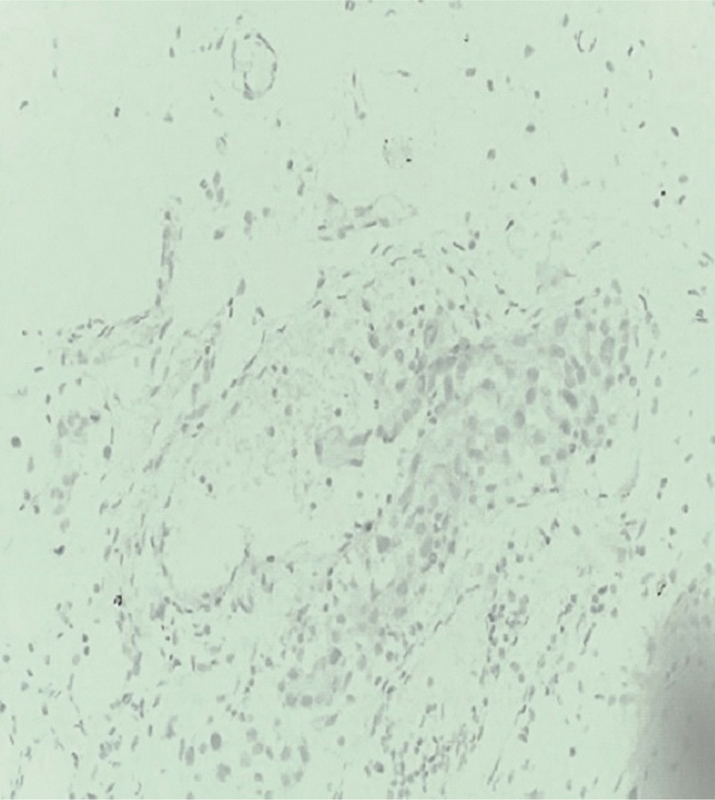 Figure 1 GATA-3 positive expression in invasive duct carcinoma, grade II, score 21/30 with intensity=3 in 70% of tumor section; original magnification X40. 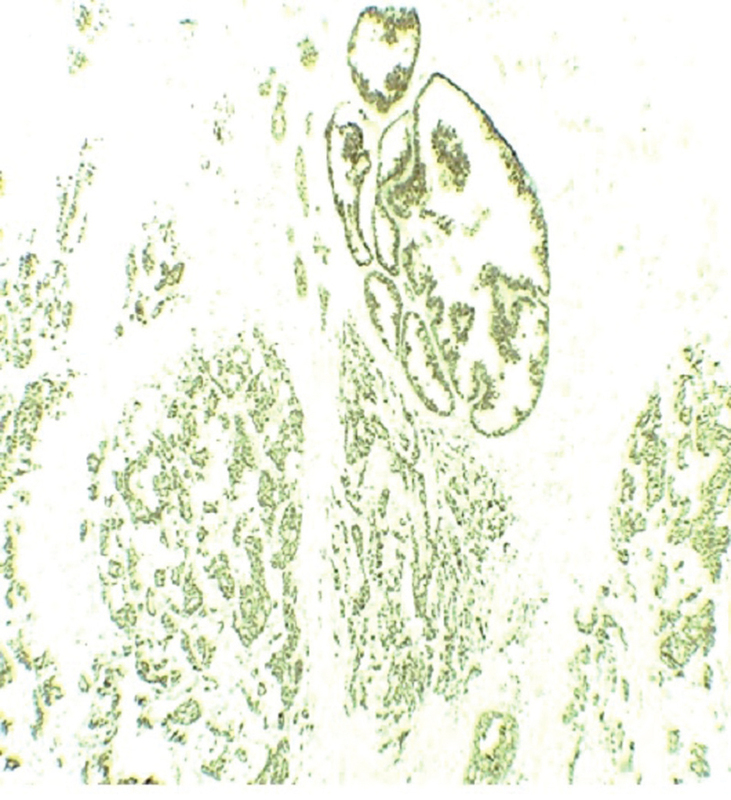 Figure 2 GATA-3 lost expression in invasive duct carcinoma original magnification X200. All possible clinicopathological variables and their correlation with GATA-3 expression are summarized in [Table 1], whereas distribution of GATA-3 positive scores is presented in [Table 2]. Regarding group 1, ER and PR positive, GATA-3 was positive in 22 (88%) cases, with a mean 22.86±6.07, whereas in group 2, ER and PR negative, GATA-3 was positive in 14 (56%) cases, with a mean of 13.29±7.36. This denotes statistically significant association between GATA-3 and ER and PR each, with P=0.031. Thirty-one (68.9%) of HER2/neu (score 0 and 1) ‘negative’ cases were GATA-3 positive, whereas 100% of HER2/neu (score 3) ‘positive’ cases were GATA-3 positive. However, this difference was statistically insignificant. In cases with Ki-67 less than 14%, GATA-3 was positive in 11 (84.6%) of 13 cases, with a mean of 23.55±6.82, whereas in cases with Ki-67 at least 14%, GATA-3 positivity was found in 25 (67.6%) of 37 cases, with a mean of 17.20±7.88. This denotes statistically significant inverse association between GATA-3 and Ki-67 (t=2.31, P=0.0269). GATA-3 positivity in various molecular subtypes was as follow: nine (81.8%) of 11 cases in luminal A, with a mean of 23.22±7.16; nine (90%) of 10 cases in luminal B-HER2/neu-negative, with a mean of 23.56±4.45; four (100%) of four cases in luminal B-HER2/neu positive, with a mean of 20.5±7.68; and 14 (56%) of 25 cases in triple negative, with a mean of 13.29±7.36. Through an analysis of KW test, significant association was detected between GATA-3 expression and both luminal A and B-HER2/neu-negative tumors when compared with triple-negative subtype. These observations suggested a correlation between increased GATA-3 expression and estrogen and progesterone in breast cancer, signifying being a promising new breast-specific immunomarker. However, no evident correlations were observed between GATA-3 expression and other clinicopathological features. Development of breast neoplasia involves hormones such as estrogen and progesterone that regulate cell proliferation and apoptosis . Nowadays, breast cancer clinical classification is based on expression of various immunohistochemical markers. Hormone receptors are the most significant . GATA-3 is a promising, sensitive, and relatively specific marker for breast carcinoma . In the current study, we first illustrated the expression of GATA-3 in breast cancer tissues by immunohistochemistry as being a practical and cost-effective method present in almost all laboratory centers, in contrast to molecular studies, followed by demonstrating the association between GATA-3 expression and clinicopathologic parameters and then concentrated on its role in breast cancer molecular classification. In our study, we found GATA-3 immunostaining positivity in 88% of cases of group 1, which was ER and PR positive. Previous studies agreed that GATA-3 is among the best predictors of ER positive status with reported expression of 87.7% by Albergaria et al. , 72% by Yang et al. , and 89% by El Hag et al. . However, they suggested that GATA-3 mRNA expression has a strong association with ER status. Regarding group 2, that is, ER and PR negative, we found that 56% of the cases showed positive GATA-3 expression. Reports of GATA-3 expression in ER-negative breast carcinomas varied between 16% in a study done by Albergaria et al. and 5% by Yang et al. . Higher values of 50 and 48% have been reported in more recent studies by Cimino-Mathews et al. and Byrne et al. , respectively. The varying degrees of expression reported may be caused by the difference in the surgical procedure. In the current study, all sections were prepared from excised mass whether by MRM or quadrentectomy; however, previous studies included core biopsies. Moreover, this discrepancy could be explained by geographic variability, sample size, choice of the antibody used, differences in immunohistochemical protocols, and scoring with a different setting of threshold scores; therefore, a need for multicenter studies is required to confirm GATA-3 expression. In this study, GATA-3 was expressed in 72.1% of grade II and 71.4% of grade III tumors, so it failed to show association with histological grading. On the contrary, GATA-3 expression showed an inverse association with histological grade as documented by Ping et al. . This contradiction may be related to accidental absence of grade I, predominance of grade II (86%), and low percentage of grade III tumors (14%). By applying the molecular classification of breast cancer, and correlating with GATA-3 expression, GATA-3 positivity was detected in 81.8% of luminal A subtype, 90% of luminal B-HER2 negative, 100% of luminal B-HER2 positive, and 56% of triple negative subtype. Through the analysis of KW test, significant association was detected between GATA-3 expression in both luminal A and B-HER2-negative tumors when compared with GATA-3 expression in triple-negative subtype. The same was reported by Jiang et al. . This observation agreed with the hypothesis that GATA-3 mutations might be important in the etiology of luminal-like breast cancers. We found inverse association between Ki-67 and GATA-3 expression; matching results were reported by Dydensborg et al. and Kim et al. who detected reduction of Ki-67 proliferation index after overexpression of GATA-3 gene in the highly aggressive LM2-4175 (LM2) cell line. In the present study, no association could be found between GATA-3 expression and any of the studied clinicopathological features including age, tumor size, number of masses, laterality, tumor and nodal staging, or lymphovascular invasion or HER2/neu status. This was supported by a cohort study created by Albergaria et al. . They found GATA-3 was neither a predictor for breast cancer disease-free survival nor a marker of prognostic significance. However, these results were contradictory with those reported by Cakir et al. who found a statistically significant association between GATA-3 expression and clinicopathological parameters. Accordingly, they stated GATA-3 as a prognostic marker through its ability for promotion of differentiation of luminal progenitor cells. In this study, the intensity of nuclear GATA-3 staining was variable among the same tumor section, even totally lost by some tumor groups, and some of these groups were detected within lymphovascular spaces; this could be explained by the suggestion that GATA-3 plays a contributory role in metastasis formation in breast cancer with its level of expression lower in metastases rather than their corresponding primary tumors. Thus, progression to a GATA-3 negative state may suggest onset of tumor dissemination. Strong association was found between ER and PR and GATA-3 expression in breast cancer, with evidence of inverse association with Ki-67 overexpression. Significant association was detected between GATA-3 expression and both luminal A and B-HER2/neu-negative tumors when compared with GATA-3 expression in triple-negative subtype. GATA-3 showed no significant association with any of the clinicopathological parameters. GATA-3 showed variable intensity, and even lost expression in some tumor groups, suggesting that GATA-3 may plays a causal role in metastasis formation in breast cancer. Keshtgar M, Davidson T, Pigott K, Falzon M, Jones A. Current status and advances in management of early breast cancer. Int J Surg 2010; 8:199–202. Grasia A, Weiss H, Lee A, Schiff R, Placido S, Osborne C, Elledge R. Estrogen receptor-positive, progesterone receptor–negative breast cancer: association with growth factor receptor expression and tamoxifen resistance. J Natl Cancer Inst 2005; 97:1254–1261. Doisneau-Sixou SF, Sergio CM, Carroll JS, Hui R, Musgrove EA, Sutherland RL. Estrogen and antiestrogen regulation of cell cycle progression in breast cancer cells. Endocr Relat Cancer 2003; 10:179–186. Gruver A, Mahul B, Luthringer D, Westfall D, Arora K, Farver C et al. Selective immunohistochemical markers to distinguish between metastatic high-grade urothelial carcinoma and primary poorly differentiated invasive squamous cell carcinoma of the lung. Arch Pathol Lab Med 2012; 136:1339–1346. Merika M, Stuart H. DNA-binding specificity of GATA family transcription factors. Mol Cell Biol 1993; 13:4011–4022. Asselin-Labat ML, Sutherland KD, Barker H, Thomas R, Shackleton M, Forrest NC et al. GATA-3 is an essential regulator of mammary-gland morphogenesis and luminal-cell differentiation. Nat Cell Biol 2007; 9:201–209. Haiyan L, Jianhui S, Jeffrey W, Prichard D, Yun G, Fan L. Immunohistochemical evaluation of GATA-3 expression in ER-negative breast carcinomas. Am J Clin Pathol 2014; 141:648–655. Lakhani SR, Ellis LO, Schnitt SJ, Tan PH, van de Vijver MJ. Tumors of the breast in World Health Organization classification of tumors. Pathology and genetics of tumors of breast and female genital organs. 4th ed. Lyon: IARC Press; 2012. p. 8. Ellis IO, Reis-Filho JS, Simpson JF, Decker T. Invasive breast carcinoma: introduction and general features in World Health Organization classification of tumors. 4th ed. Lyon: IARC Press; 2012. p. 19. Liu N, Yang Z, Liu X, Niu Y. 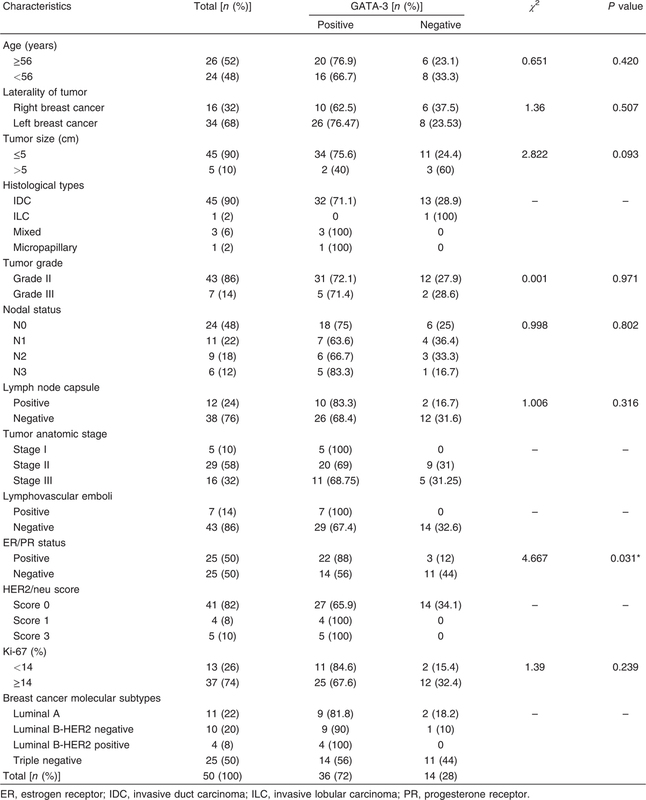 Lymph node status in different molecular subtype of breast cancer: triple negative tumours are more likely lymph node negative. Oncotarget 2017; 2:55534–55543. Edge SB, Byrd DR, Compton CC, editors. AJCC (American Joint Committee on Cancer) Cancer Staging Manual. 7th ed. New York, NY: Springer-Verlag; 2010. pp. 347–377. Gujam FJ, Going JJ, Edwards J, Mohammed ZM, McMillan DC. The role of lymphatic and blood vessel invasion in predicting survival and methods of detection in patients with primary operable breast cancer. Crit Rev Oncol Hematol 2014; 89:231–241. Miettinen M, McCue PA, Sarlomo-Rikala M, Rys J, Czapiewski P, Wazny K et al. GATA3: a multispecific but potentially useful marker in surgical pathology: a systematic analysis of2500 epithelial and nonepithelial tumors. Am J Surg Pathol 2014; 38:13–22. 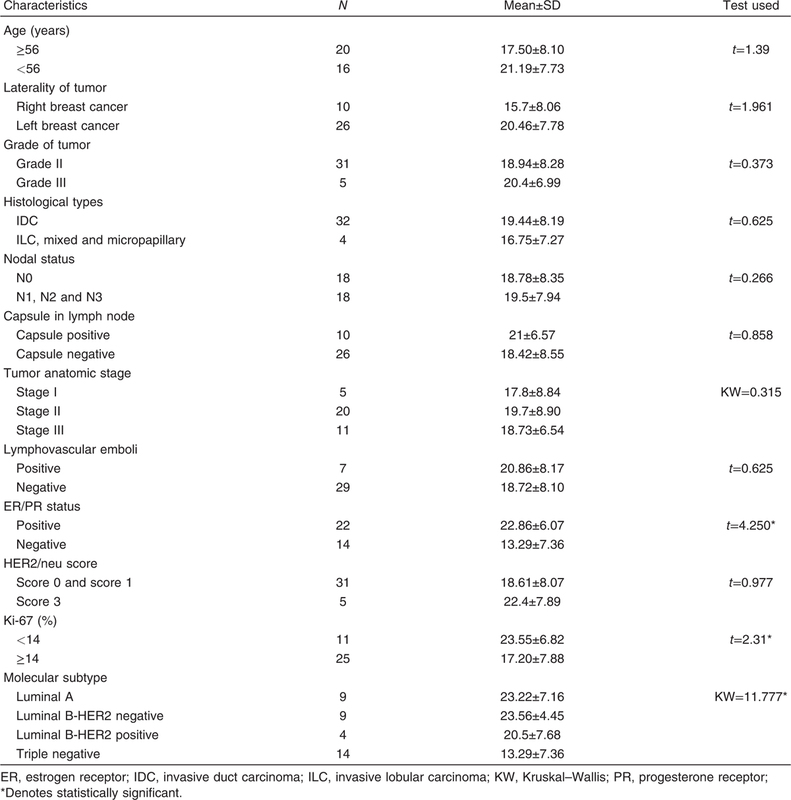 Thorat MA, Marchio C, Morimiya A, Savage K, Nakshatri H, Reis-Filho JS, Badve S. Forheadad box A1 expression in breast cancer is associated with luminal subtype and good prognosis. J Clin Pathol 2008; 61:327–332. Badve S, Nakshatri H. Oestrogen receptor-positive breast cancer: bridging towards histopathologic and molecular classifications. J Clin Pathol 2009; 62:6–12. Goldhirsch A, Wood WC, Coates AS, Gelber RD, Thurlimann B, Senn HJ. Strategies for subtypes − dealing with the diversity of breast cancer: highlights of the St Gallen International Expert Consensus on the Primary Therapy of Early Breast Cancer. Ann Oncol 2013; 22:1736–1740. Oh H, Eliassen AH, Wang M, Smith-Warner SA, Beck AH, Schnitt SJ et al. Expression of estrogen receptor, progesterone receptor, and Ki67 in normal breast tissue in relation to subsequent risk of breast cancer. NPJ Breast Cancer 2016; 2:16032–16042. Mehmeti M, Allaoui R, Bergenfelz C, Saal LH, Ethier SP, Johansson ME et al. Expression of functional toll like receptor 4 in estrogen receptor/progesterone receptor-negative breast cancer. Breast Cancer Res 2015; 17:130. Albergaria A, Paredes J, Sousa B, Milanezi F, Carneiro V, Bastos J et al. Expression of FOXA1 and GATA-3 in breast cancer: the prognostic significance in hormone receptor-negative tumours. Breast Cancer Res 2009; 11:R40. Yang Y, Lu S, Zeng W, Xie S, Xiao S. GATA3 expression in clinically useful groups of breast carcinoma: a comparison with GCDFP15 and mammaglobin for identifying paired primary and metastatic tumors. Ann Diagn Pathol 2017; 26:1–5. El Hag MI, Ha J, Farag R, El Hag AM, Michael CW. Utility of GATA-3 in the work-up of breast adenocarcinoma and its differential diagnosis in serous effusions: a cell-block microarray study. Diagn Cytopathol 2016; 44:731–736. Cimino-Mathews A, Subhawong AP, Illei PB, Sharma R, Halushka MK, Vang R et al. GATA3 expression in breast carcinoma: utility in triple-negative, sarcomatoid, and metastatic carcinomas. Hum Pathol 2013; 44:1341–1349. Byrne DJ, Deb S, Takano EA, Fox SB. GATA3 expression in triple negative breast cancers. Histopathology 2017; 17:63–71. Ping Z, Xia Y, Shen T, Parekh V, Siegal GP, Eltoum IE et al. A microscopic landscape of the invasive breast cancer genome. Sci Rep 2016; 6:27545–27557. Jiang YZ, Yu KD, Zuo WJ, Peng WT, Shao ZM. GATA3 mutations define a unique subtype of luminal-like breast cancer with improved survival. Cancer 2014; 120:1329–1337. Dydensborg AB, Rose AA, Wilson BJ, Grote D, Paquet M, Giguère V et al. GATA3 inhibits breast cancer growth and pulmonary breast cancer metastasis. Oncogene 2009; 28:2634–2642. Kim S, Moon BI, Lim W, Park S, Cho MS, Sung SH. Expression patterns of GATA3 and the androgen receptor are strongly correlated in patients with triple-negative breast cancer. Hum Pathol 2016; 55:190–195. Cakir A, Isik Gonul I, Ekinci O, Cetin B, Benekli M, Uluoglu O. GATA3 expression and its relationship with clinicopathological parameters in invasive breast carcinomas. Pathol Res Pract 2017; 10:227–234.